Purchasing or replacing a new air-conditioner? Why not put some cash back into your pocket by purchasing a PeakSmart air-conditioner! 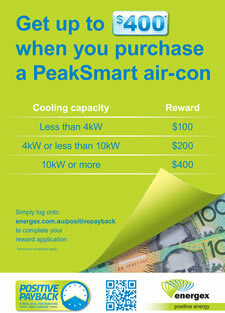 You will be rewarded up to $400 by connecting to the Energex PeakSmart program. What is PeakSmart? PeakSmart air-conditioning is designed to help reduce peak demand without compromising your air-conditioners performance. Which means on a few days of the year, your energy consumption is capped for short periods whilst your system continues to produce cool air.